The most dangerous phrase in construction is "while I have this open, I'll just...." It's the renovator's version of "Hey, hold my beer and watch this!" This week's version is my little tiny easy channel along the back of the brick path in front. At first I thought I would just dig down and pin the tubing in place and that would be it. Then I thought I would dig deeper and get some of those excessive stones out of there. Then I thought I would extend the bricks back (I'd left out a row because when I made the path I ran out of good bricks). Then I decided to just lift and redo the whole thing. It's still spitting rain every now and then, so all I got done was lifting the bricks out a little digging out of extra dirt. I think I might bring out the soil sifter tomorrow, because there are a lot of rocks in there and it's hard to level out dirt with rocks in it. 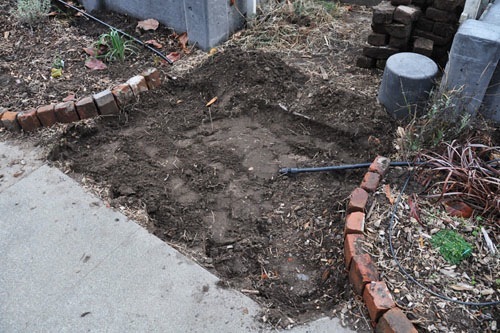 I'll rinse off the bricks, then re-lay them and plant some more wooly thyme in the gaps. A little more involved than just running the tubing across the sidewalk. PS: Thank you, Steve Jobs, for everything you gave us.